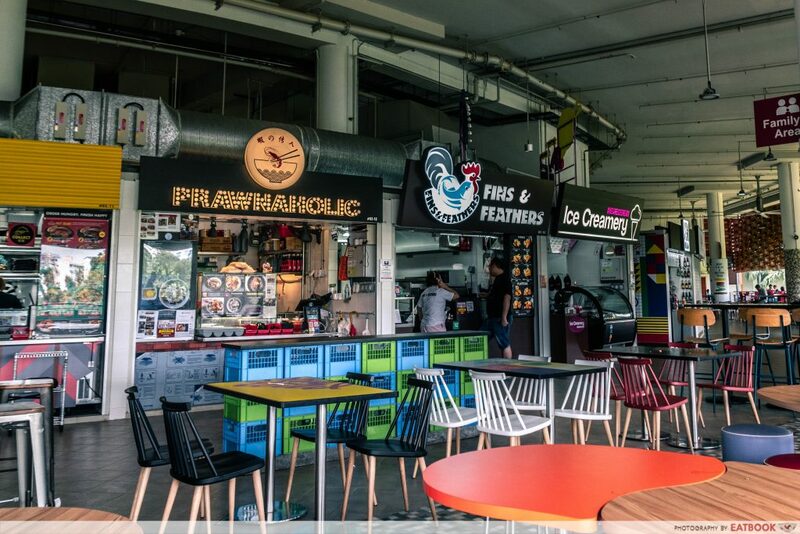 Earlier this year, we checked out the hipster part of Pasir Ris Central Hawker Centre that opened in January. It was then that we tried food from Prawnaholic for the first time and unfortunately, went home unimpressed. Fast-forward four months, we were still hearing about the prawn noodles from Prawnaholic and how crazy the queue gets during peak hours. 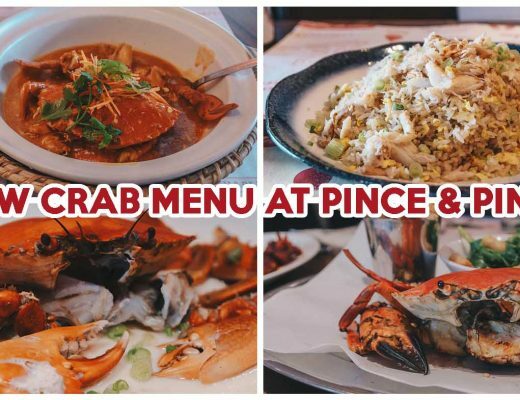 Determined not to let our first impression be cast in stone, we headed to Pasir Ris again to give other items on the menu a try! 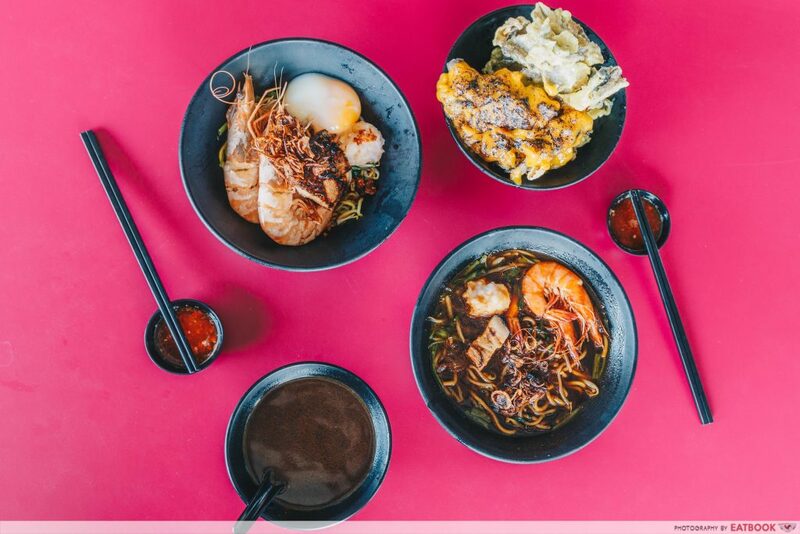 The signature dish at Prawnaholic is their Special Prawn Noodles ($6.50). We opted for the soup version and this was a huge bowl of intensely dark prawn broth brimming with yellow noodles, two huge prawns, a handmade prawn ball, and pieces of torched kurobuta pork. The most crucial element of prawn noodles, the broth, did not disappoint. Just as the colour of the soup is much darker than the usual ones you find elsewhere, you can also expect the taste of prawn stock to be much more distinct here. 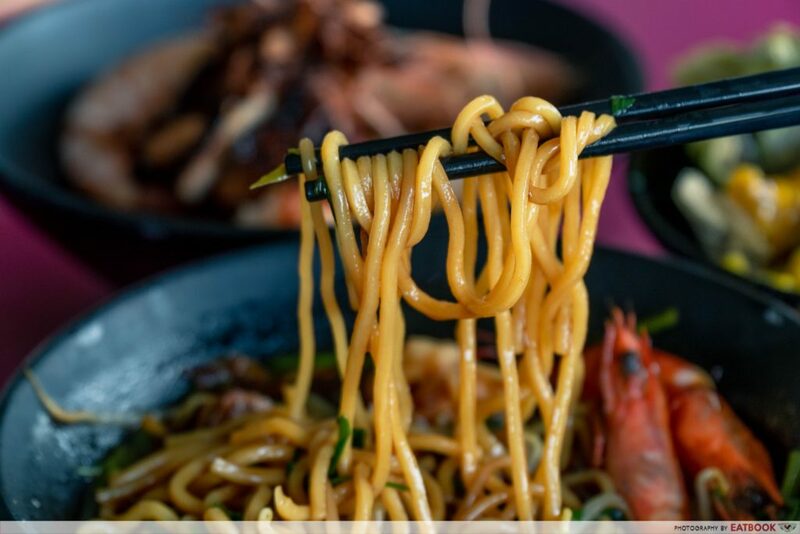 The best thing about this dish is that the noodles are drizzled with thick sauces before the soup is poured over it. 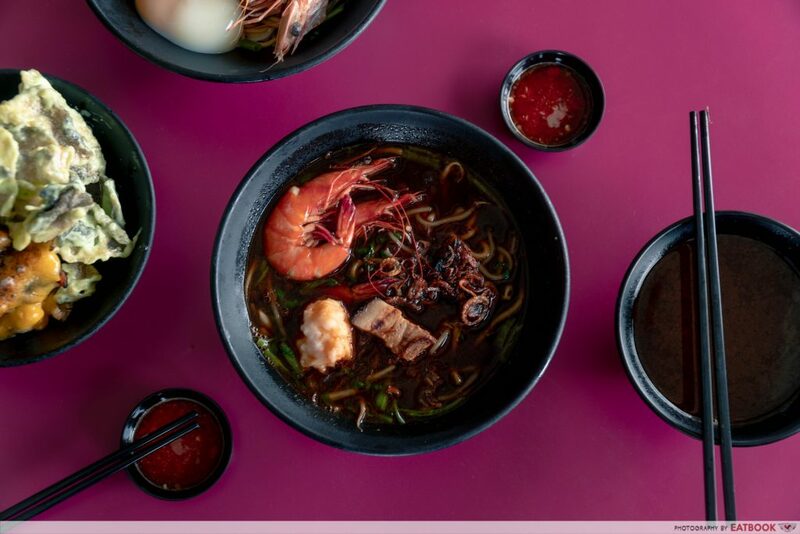 This gave every bite of the noodles a stronger punch of flavours where you first taste the saltiness of the sauce before the sweeter broth kicks in. The prawns were huge and fresh. 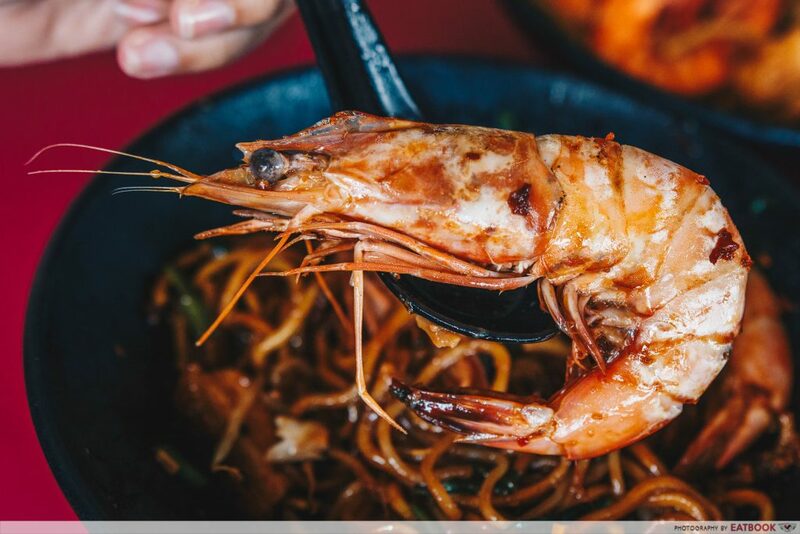 Though they also have a King Prawn Noodles ($8.50) option, the regular prawns were only slightly smaller than the king prawns, making every cent spent on this dish worth it. 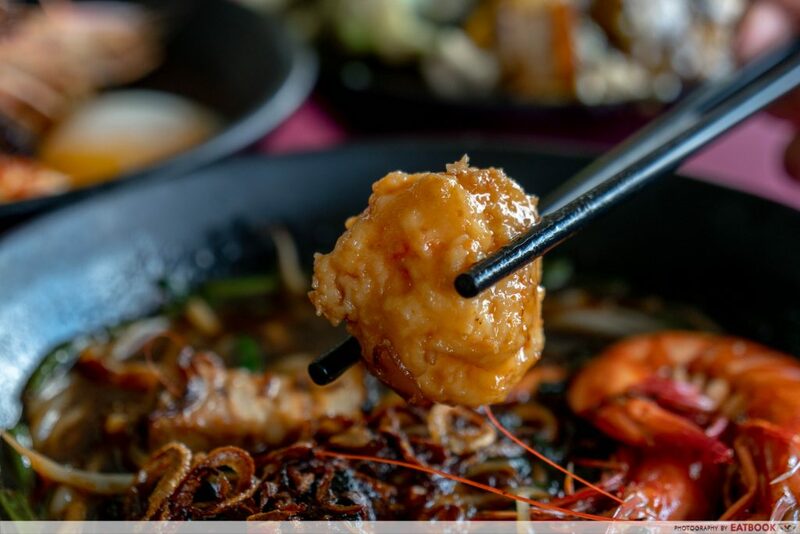 Their handmade prawn ball was packed with real shrimp meat and while I would have liked it better if it was chewier, it was still an overall enjoyable and interesting addition to typical prawn noodles. My favourite part of this dish had to be the kurobuta pork. Torched upon order, the charred piece of meat was simply delicious. 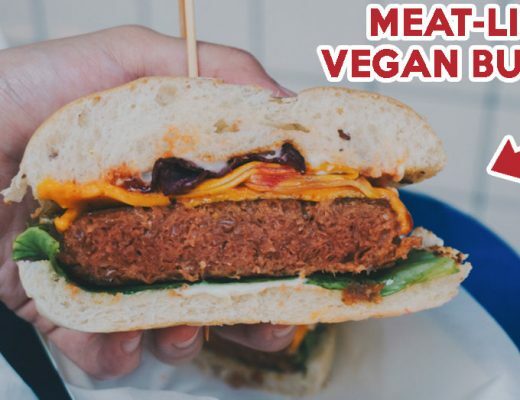 The thick layer of sauce that coated the pork was sweet and savoury, and as I chewed further, I was impressed by how well the meat retained its juices. Though the portion of meat given was already generous, I could not help but wish I could have more. The other dish we had was their King Prawn Noodles ($8.50), where we went for the dry version and topped it up with an Onsen Egg ($1). On top of the ingredients that were found in the previous dish, this one also had a decadent amount of fried pork lard and fried chilli bits. Toss it all up with the runny egg yolk and we got a heap of relatively wet noodles that was dripping with sauce. Because of how heavily seasoned the noodles were, every bite packed a punch and was sweet, savoury, and slightly spicy all at the same time. Though the crunch from the pork lard and chilli bits made the noodles addictive, the overall mix was too heavy for any of us to finish a bowl by ourselves – not a bad thing for the big eaters though! Like the ones in the previous dish, the king prawns were fresh and getting the flesh off the shell was a piece of cake. Size-wise, they were not much bigger than the ones in the regular bowl so I’d probably opt for the cheaper Special Prawn Noodles the next time I visit. The last dish that we got to share was their Fish Skin w/ Pork ($8.50), the newest item on their menu. This consisted of fried fish skin topped with kurobuta pork. We chose to have half the bowl flavoured in Wasabi Mayo and the other half in Salted Egg Yolk sauce. The taste of wasabi in the Wasabi Mayo was subtle while the Salted Egg Yolk sauce reminded me more of torched mentaiko mayonnaise, but a grainier version. Though the sauces did not taste the way I had expected, they were nonetheless flavourful and were interesting finds in a hawker centre. 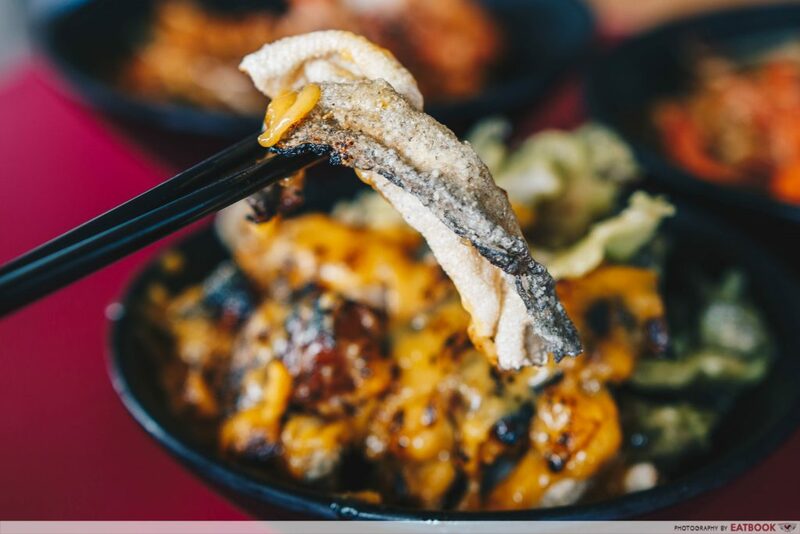 The fish skin was thickly cut, giving each piece a distinct bite and taste. Even with the sauces coating the fried fish skin, the original taste of the fish skin was not overwhelmed. 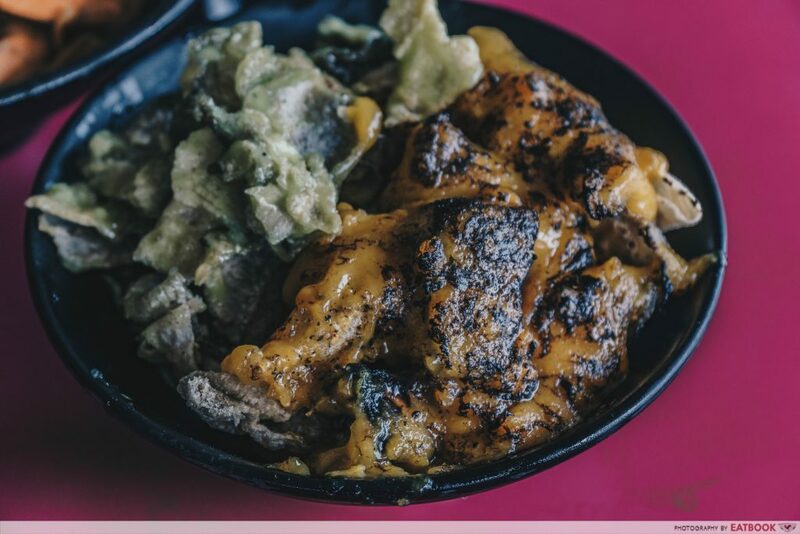 Together with the juicy pieces of kurobuta pork, every bite was sinfully addictive and is definitely a dish to be shared by two or more. 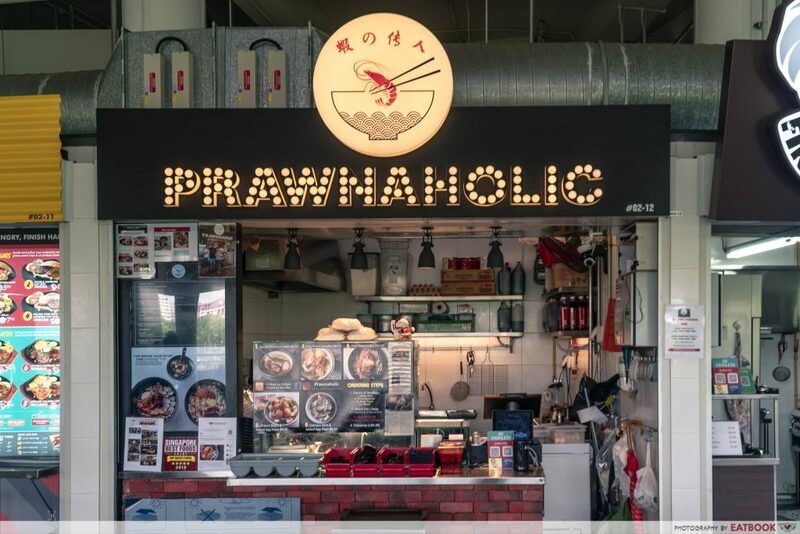 Prawnaholic is located at The Fareground, the second floor of Pasir Ris Central Hawker Centre. Though outdoors, the place is well-ventilated with many fans and we enjoyed continuous breeze during our time there. There were also ample seats at the hawker centre including some with low tables that are kid-friendly. I headed to the stall feeling slightly apprehensive but went home satisfied and impressed. 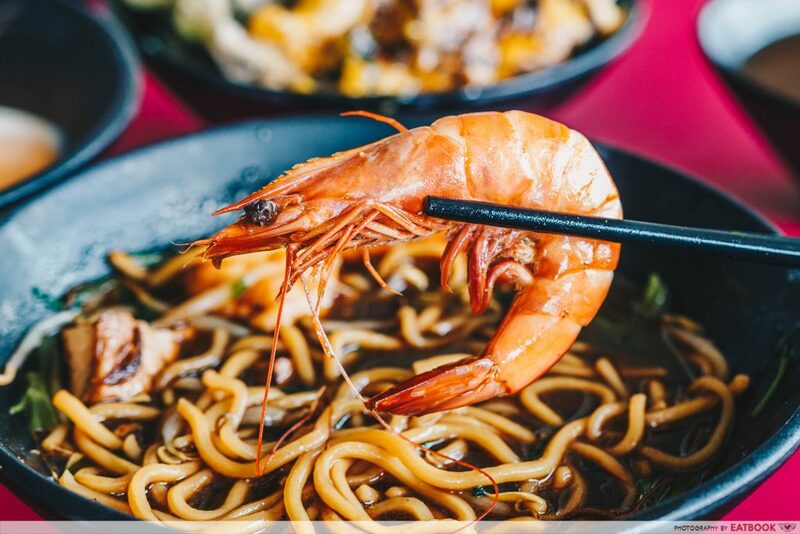 Though the prawn noodles here are a few dollars more than the usual ones you find elsewhere, their ingredients justify the prices. 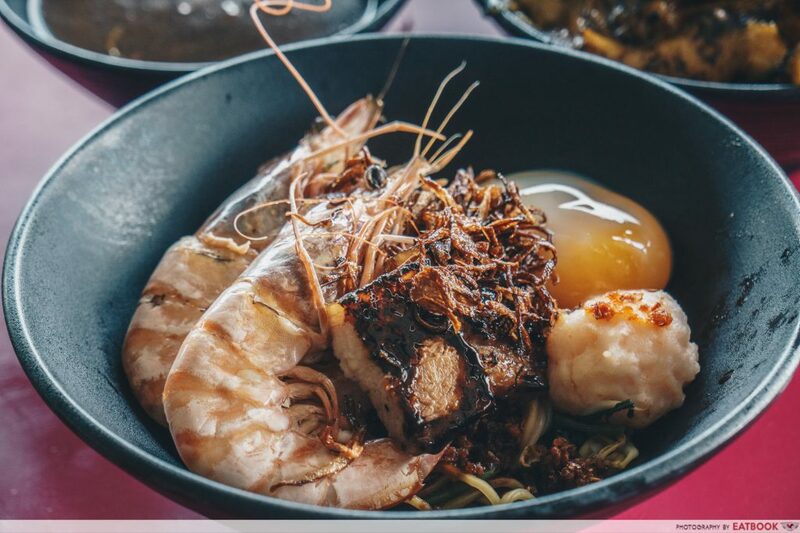 Besides the bigger-than-usual prawns, special ingredients such as the kurobuta pork and prawn balls made every cent worth it. 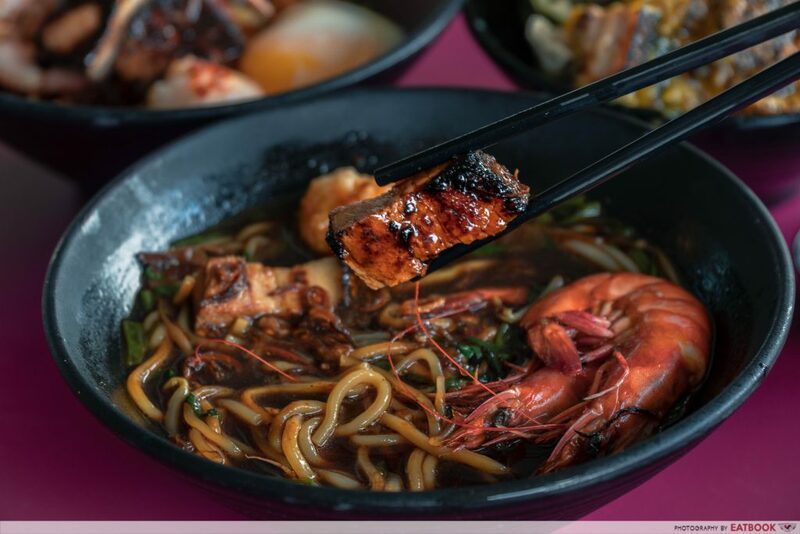 Though Pasir Ris is far from where I live, I will surely be back for their Special Prawn Noodles and Fish Skin w/ Pork! 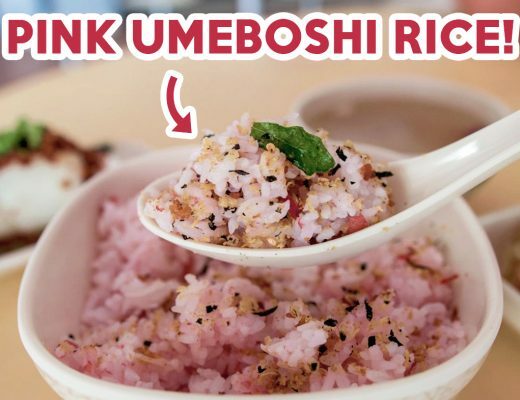 If you are there, you’d also want to check out other good food at Pasir Ris Central Hawker Centre!